High temperatures fueled wildfires, warmed and dried up surface water, exacerbated drought conditions, and wilted crops around the globe. 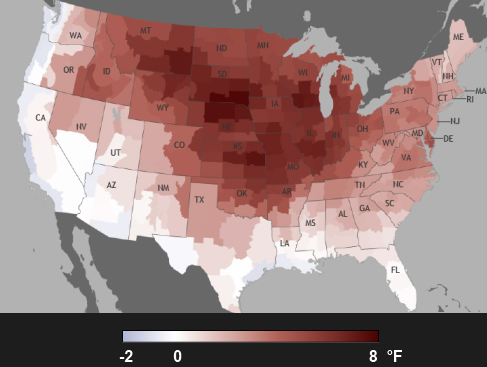 July 2012 was the hottest month on record in the United States. The Antarctic Peninsula, much of eastern Europe, and North Africa also recorded unusually warm temperatures in July. To the contrary, Australia, Northern and Western Europe, Eastern Russia, Alaska, and Southern South America were cooler than normal. A statistical trend towards climate extremes concerns climatologists. The average combined global land and ocean surface temperature was 1.12°F above the 20th century average (60.4°F) for July. The Northern Hemisphere land surface temperature was the all-time warmest July on record since 1895, at 2.14°F above the average. Over 2 million acres burned in the United States due to wildfires (the fourth most since 2000). Moderate to exceptional drought conditions were recorded in 62.9 percent of the contiguous United States. It was the fourth consecutive month the Northern Hemisphere set a new monthly land temperature record. Sea ice in the Arctic averaged only 3.1 million square miles (the second lowest July sea ice extent on record). Mapping The Hot Summer. NASA Earth Observatory. GISS Surface Temperature Analysis (GISTEMP). NASA. Perception of Climate Change by James Hansen, Makiko Sato, and Reto Ruedy. Proceedings of the National Academy of Sciences of the United States of America, March 2012. Brutal July heat a new U.S. record. CNN, August 2012.